We, the undersigned. 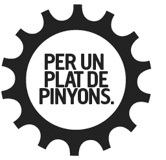 | Per un plat de pinyons. We hope this text doesn’t clear up any doubts, quite the contrary, we would like to generate questions. Because questions are the indispensable motor for engaging whichever project, if you know how to grab them by the handlebars. …and you begin to calculate distances and to consult encyclopaedias, until one foggy night you ask yourself if you are capable of going, to leave everything for a while in exchange for your adventure. And when you’ve done that, when you’ve asked yourself “Why not?” it’s already too late: you’ve just decided to go. There’s less than a month till we leave home loaded like mules in direction of the rising sun and where anyone could think we were sportsmen, journalists, investigators, spies, counter spies, or anything even worse; philanthropists or missionaries. But that would be the furthest from the truth. Nor are we going to ‘find ourselves’ in a transcendental journey which takes us to our more zen and mystical side, nor to find out how much misery there is in the world and how fortunate the West is, blah, blah, blah…. For that, friends, there’s no need to go far from home. Whoever is hoping for grand and metaphysical speeches; change the channel now. If we leave it’s actually because we know ourselves too much (and not the opposite) and we know that in a few years time we would regret not having taken this step along the path we have already started taking. Above all it’s about a hedonistic project and it would be unjust on our part to try to disguise it as anything else. On the 1st of September we’re grabbing our bikes and the flag of inexperience and leaving towards the great unknown. The moment the novice arrives at the dock of the port and puts a foot onboard the ship, constitutes crossing a line. This brief lapse in time divides life in two. It separates everything that stays behind and immediately submerges him into a new and irrevocable dimension. We’re leaving because we’ve exhausted punctuality, obedience and alienation; because we don’t like fitting ourselves into the model prepared for us; because we know that there are many ways to do things and because we’re convinced that the only way to progress, grow and learn is to take the imaginary jump into unexplored territory. Per un plat de pinyons. from matema on Vimeo. We haven’t chosen to go on bike to save the world from CO2 emissions (even though that would portray a good eco-image of us). 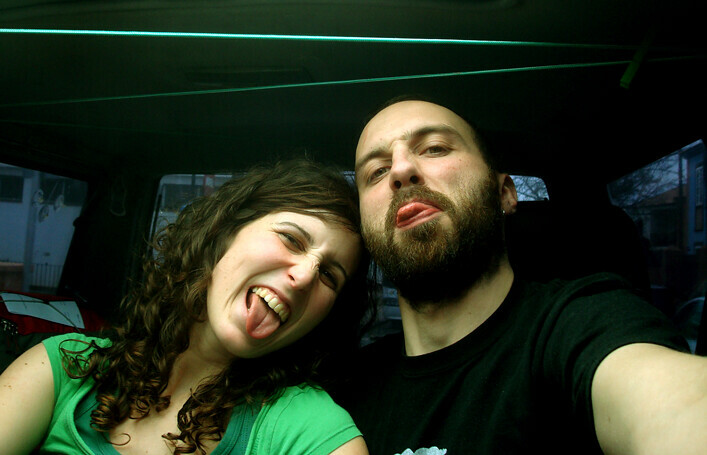 And if we wanted to be fit, we would have bought a static bike and some weights. We’ve chosen bikes because we like the hard way that Chet Baker proposes, and because we have the intuition that, in reality, it’s the most interesting. Because on bike everything acquires a categorical value (both negative and/or positive) which makes you notice that blood still runs through your veins. Because in some things we are still more analogical than digital and we appreciate concrete facts rather than statistics, abstracts and prefabricated headlines. The bicycle makes us be on the ground metre by metre and this concreteness gives us a personal and close perspective of what and who surround us. It skives before the particular. As the 1st approaches we are losing perspective of the project and more logistical doubts and unsolved questions arise. That, which from far away seemed a magnificent solid block, without cracks, now up close seems more fragile and formed by an infinite number of enigmas to resolve: visas, insurances, climates, luggage, accommodation, food, first aid, the route, documentation….The knee jerk reaction is to break down the whole, using reason. But then you realise that the deeper you go, the more ends there are to tie: will we be physically ready enough? Do we know where we’re going? Have we read enough about everything? Are we well informed?… But we’re extremely proud that it’s like that: that means that we have travelled far in our hour of projection: “the question” will be the motor that will make us start to peddle in a month’s time and therefore resolve this equation. When the result leads us to the process, we’ll only arrive to where we’ve already been. If the process leads us towards the result, maybe we won’t know where we’re going, but we’ll know we want to be there. Make no mistake! We know what good judgement is and we’re here to have a good time. We’re aware that that isn’t a promise; it’s an experiment. And we know well our own physical and psychological limits. We fully understand that a well-timed retreat is often a victory and we don’t want to prove anything to anyone. Hey! Wake up! Get your stuff and run before somebody else does it for you. And move; you won’t live forever! Freedom, Sancho, is one of the most precious gifts that heaven has bestowed upon men; no treasures that the earth holds buried or the sea conceals can compare with it; for freedom, as for honour, life may and should be ventured; and on the other hand, captivity is the greatest evil that can fall to the lot of man.